16th December, 2014: FISHING REPORT: Port Alberni Inlet, Barkley Sound, Ucluelet (West Coast), Somas-Stamp River System. Winter is almost upon us in British Columbia, Canada. In fact, we do know that when the first day of winter arrives, we are only a few days away from Christmas. We are definitely hoping that the many Pacific storms that hit the west coast with a vengeance are come and gone. The Pacific North West can often have some incredible wind and rain storms during the later part of the fall season in which there have been some very major storms. The past week on the Vancouver Island, British Columbia west coast and inland areas there has been up to eight inches of rain in under forty-eight hours. The vast amount of precipitation also brought very warm conditions which created a snow melt at the higher levels. The storm from this past week created incredible flood conditions in most lakes, rivers and creeks. The autumn season has been remarkably wet and windy but there has also been some remarkably outstanding good weather with very cool conditions. This type of weather condition did provide some fall opportunities for avid fresh water and salt water fisher persons. The summer of 2014 seems so long ago. 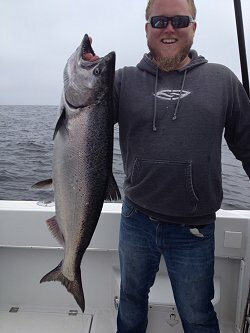 The saltwater fishing on the West Coast (offshore waters), Barkley Sound, and the Port Alberni Inlet was relatively good during the 2014 summer sport fishing season. All of the seasonal forecasts were pretty much correct as Chinook and Coho numbers migrating down the west coast waters of Vancouver Island were very high in numbers. The local West Coast Vancouver Island Sockeye and Coho numbers returning to nearby watersheds were also very good. The summer of 2015 should witness another great year of salmon fishing. The Pacific Northwest had been in a La Nina weather pattern for a few years. This pattern is ideal for salmon survival in the North Pacific. With La Nina the water stays relatively cold and the rich food sources the salmon feed on are very good which means salmon survival is quite high. We have recently come into an El Nino weather pattern. The recent heavy storms along the west coast are very typical of this condition. El Nino does warm Pacific waters. The more mature fish which are expected to return to their Natal stream and rivers in 2015 should have low mortality levels due to the fact that most of their life span to date has been under the La Nina effect. With this in mind we are looking forward to some of the pre season forecasts that will come forward early in the New Year. We are predicting the 2015 season to being like the past summer. 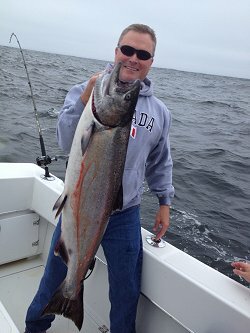 There should be some excellent salmon sport fishing on West Coast Vancouver Island. Locally there has been a little early winter Chinook fishing. A few keen sport fishermen have had some success. Areas of Barkley Sound especially around Swale Rock and Vernon Bay have had a few decent days with a few feeders weighing in from seven to ten pounds. The Fall Fishing season for summer run Steelhead in the Upper and Lower Stamp had been quite consistent to the end of November. Some guides have said the summer run Steelhead mixed in with good Coho returns provided one of the best seasons ever. 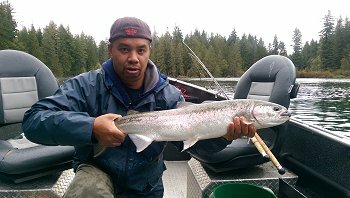 The Winter Steelhead have been arriving in reasonably good numbers and with water levels coming down over the past four or five days (after the huge storm) the Winter Steelhead fishing in the Lower River should improve dramatically. However this may take a few more days as Debris is still considered a danger. December is the month that usually has big schools of Steelhead moving into the river on a daily basis. There should be some great fishing in the days to come on the Stamp River which is close to Port Alberni located in central Vancouver Island. 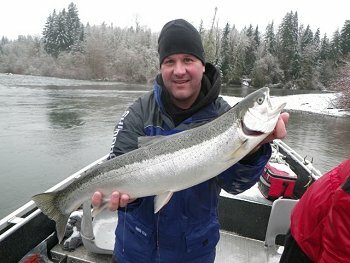 The Winter Steelhead fishing is now underway in the Stamp. With the huge storm witnessed during the December 8th week the Stamp has been pretty much non fishable. At its peak last week the Somass River was at the highest levels ever. Not since the 1964 tidal wave has the Somass River ever been as high. Since last week’s major storm the river flood waters have receded at least six to eight vertical feet. All guided trips on the river have been cancelled and hopefully during the December 15th week things can again get back to normal. With the river at flood levels there continues to be major debris making it very unsafe to be out on the water. The Upper River will definitely clear up much quicker that the lower. Areas above the Ash will be the first area that fishing opportunities will be a possibility. There is actually still a fairly decent mix of winter and summer run Steelhead in the whole system. Fresh winter Steelhead entering the system are currently from the falls down. The bulk of the Summer Run fish are in the Upper River well above the falls. The fishing hopefully very soon be accessible by boat in the upper and lower river. Those anglers who would like to walk the banks may have opportunity by Christmas week to fish from the falls down to the rifle club if there is little precipitation over the next six to seven days. The river has really declined over the past five to six days. Hopefully this pattern will continue and levels will be back to normal winter levels with good clarity. Guides and their guests and those on their own have prior to the past storm been fishing below the bucket and fishing traditionally on the float and casting roe and roe bags. Bait can be used below girl guide falls signs and artificial only used above this area . The odd person is bottom bouncing but not having anywhere near the same success as those casting and on the float into the faster water. Those using artificials lures are doing best with medium sized to large pink worms, spin-n-glos and gooey bobs. The fish that had been landed are coming in at an average of five to eight pounds. During the winter season the Winter Steelhead often peak close to the end of January or early to mid February. At this time of year there are often Steelhead weighing up to and over fifteen pounds. During the winter months there are many days where the weather is perfect for fishing on the river. Those individuals wanting to fish in the Upper River can continue fishing the Ash Confluence until December 31st. All fresh water fisher persons need to check all DFO rules. It is important to remember that only hatchery Steelhead can be tagged and with this in mind it is important to have a Steelhead tag if one is planning to retain a hatchery fish. Barkley Sound and the inside waters of Ucluelet most years have decent winter Chinook fishing from December until April. Barkley Sound boasts one of the best winter fishing derbies which takes place in early March. The Sproat Loggers derby based out of Poett Nook takes place the first weekend of March every year. Some of the past derby’s have weighed in salmon over twenty-five pounds. There have been a few reports of feeder Chinook fishing in the Sound. Areas close to the Bamfield Harbor and also Swale Rock and Vernon Bay have had reports of feeder Chinook up to eight pounds. There will be opportunity for guided trips beginning in mid February through mid April. These trips will have opportunity for guests to do some winter Chinook salmon, crab, and prawn fishing. The salmon are currently in fairly deep water with the salmon around Swale Rock and Vernon Bay in 120 to 135 feet. Anchovy in a chartreuse teaser head with six to seven feet of leader line behind a variety of glow hotspot flashers have been working the best. Various blue and green and opaque hootchies with 42 to 46 inches of leader are also working. Also working well is glow green, green nickel, and cop car four inch coyote spoons. The feeder Chinook will always swim where there are rich sources of bait fish. When one can find the bait in the Sound during the winter months the feeder Chinook will also be found. The Ucluelet Harbor close to Mara Rock, Great Bear, the lighthouse, and inner lighthouse bank has provided some decent winter fishing for feeder Chinook. Of Course the water outside the Ucluelet Harbor is not protected like Barkley Sound. During the autumn months there has been some very nice weather and the water has been very fishable. One group of guests got into some nice fish with the opportunity of landing up to ten salmon on one trip near Scotch Bay. This particular trip had wonderful weather in the afternoons. The group was able to land five of the ten salmon which weighed eight to twelve pounds. Most of the fish were in tight to land with both Mara Rock and the back of Great Bear producing the fish. Coyote spoons in the four and three and a half inch were working. Glow and green glow, cop car, silver glow, and blue nickel have all worked relatively well for feeders. We are looking forward to some wonderful days out on the water during the winter months. A small heater does wonders and keeps everyone fairly warm. The salmon are bright and very tasty and yes, during our winter trips we also include some crabbing and prawn fishing for guests. We are looking forward to the spring and summer sport fishing season in 2015. Indicators look good for a very good healthy amount of salmon migrating to the watersheds to the distant south and also returns back to West Coast Vancouver Island look very reasonable. Those individuals that enjoy fishing in scenic and calm waters should organize trips in the Port Alberni Inlet from mid June through the end of August. The Sockeye fishery is a fun family oriented activity. This usually begins about the middle of June and continues right into early August.